Oh, man. This is just too cool. Cars like this really make me realize that I need more storage space (and money). Basically, the A112 Abarth is an Autobianchi A112 with a 1049cc engine in it. The engine put out around 70 HP. While that might not sound like a lot, the A112 weighed around 1500 lbs and 70 HP was more than enough HP to move it with some serious brio. It did it in the traditional Italian style of lots or revs and lots of great sounds. 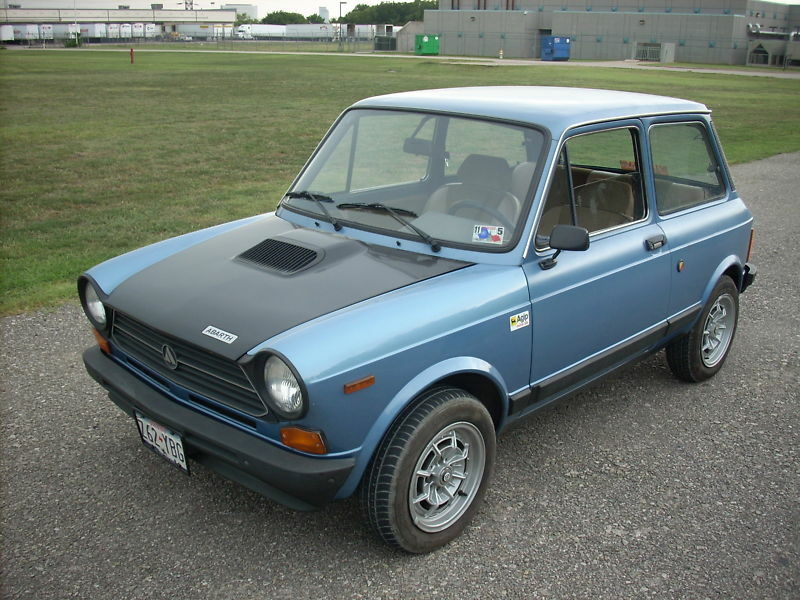 There are bootleg A112 Abarths around, but the seller says this is the real deal. The A112 is a boxy car, which is a look I like. The only real difference between the standard A112 and the Abarth A112 - besides the Abarth badges - is the flat black hood. 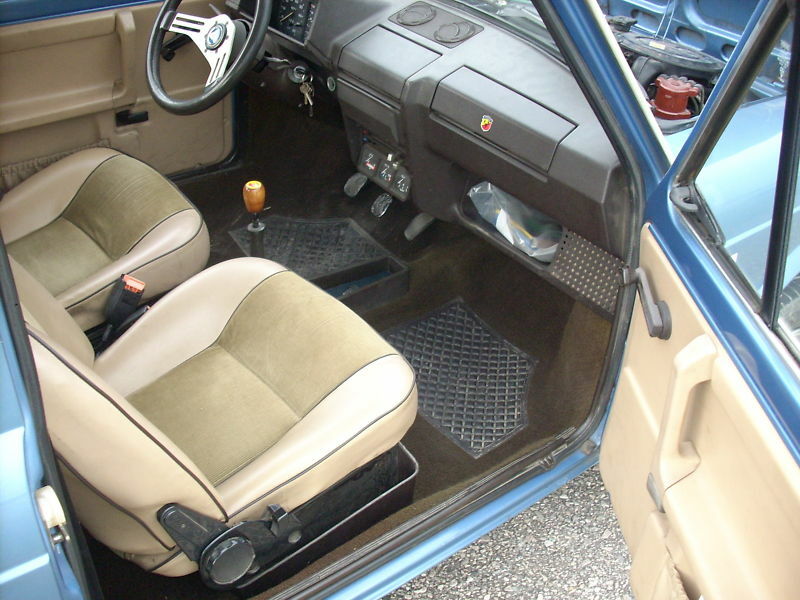 The interior is very plain and very simple. These cars are about "go", not "show". They were very successful European Rally cars. Not a trailer queen and not a rat, this is a great looking unrestored car. It appears to have been well driven and well taken care of. The seller claims the body is all original and rust free. It's a car you could bring to shows and drive often. 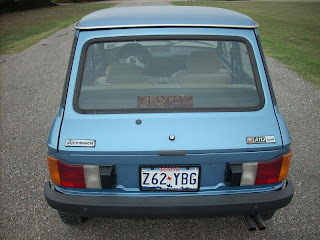 I had a 1972 Autobianchi A112 a few years ago. I loved that car, it truely waone of my favorite cars I ever owned. This car has really been shoppped. It was on the L.A. Craigslist a couple of weeks ago. At some point it appears to be painted as the front doesn't match the door. Cool car, just a little steep. 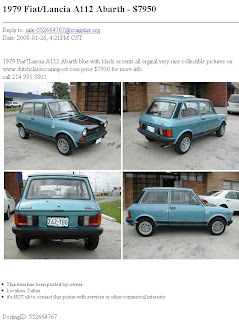 You can still find quite a few standard A112 models out there in all price ranges. However, the Abarth models have become quite pricey. The seller still has the Abarth listed for $10.5K on the website "classiccarsofplano.com" if you would like a second look. That's a bit high for what it is however. I'm jealous of you having owned an A112. I spotted that paint color discrepancy, too. But, the more I looked at it the more it looked like it was caused by the way the light was hitting the car. I gave the seller the benefit of the doubt that it's original paint. Yeah, agree with you this car seems a great looking unrestored car. I have Motorcycle Trailers and the body was custom made, build and tow by myself.